This building has none of the landscape-integrating prairie horizontals of Frank Lloyd Wright’s houses but instead hits you across well-maintained landscape as a massive squat pile of bricks. Inside the geometry of the circle dominates, reminiscent of the National Assembly building, Dacca. I found the contrast between the simple – and stark – modern geometries and the fancy baroque travertine stair curious. The rough brick carrying into the interior – you brush against it moving up and down the stairs or squeezing past carrousels – has a harshness that I haven’t felt in Aalto’s houses where he used this device, to me the building has massive power, major ego but lacks the sheer class of the Salk Institute or the rational elegance of the Richards Medical Center. 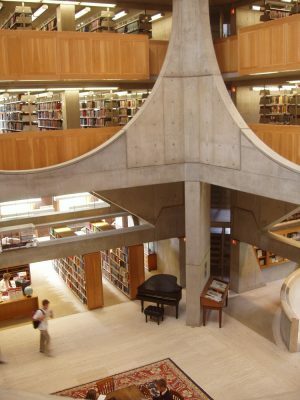 The Phillips Exeter Academy Library in Exeter, New Hampshire, U.S., with 160,000 volumes on nine levels and a shelf capacity of 250,000 volumes, is the largest secondary school library in the world. 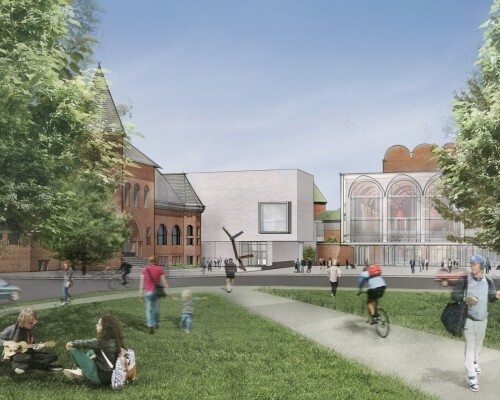 It is part of the Phillips Exeter Academy, an independent boarding school. 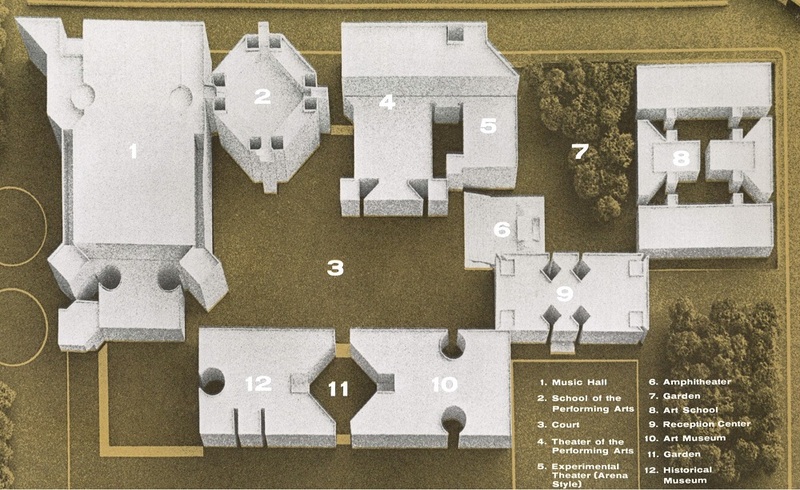 When it became clear in the 1950s that the library had outgrown its existing building, the school initially hired an architect who proposed a traditional design for the new building. 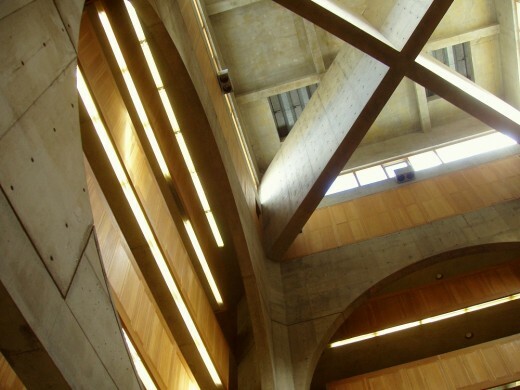 Deciding instead to construct a library with a contemporary design, the school gave the commission to Louis Kahn in 1965. 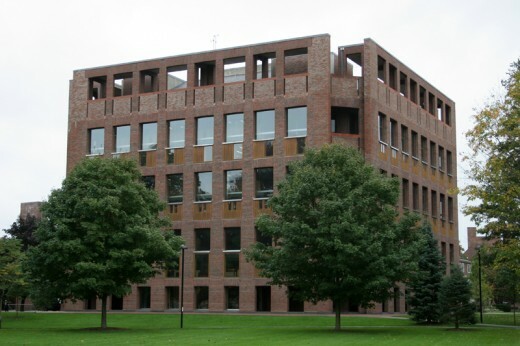 In 1997 the library received the Twenty-five Year Award from the American Institute of Architects, an award that recognizes architecture of enduring significance that is given to no more than one building per year. Kahn structured the library in three concentric square rings. 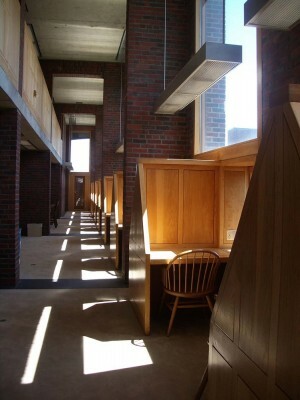 The outer ring, which is built of load-bearing brick, includes all four exterior walls and the library carrel spaces immediately inside them. 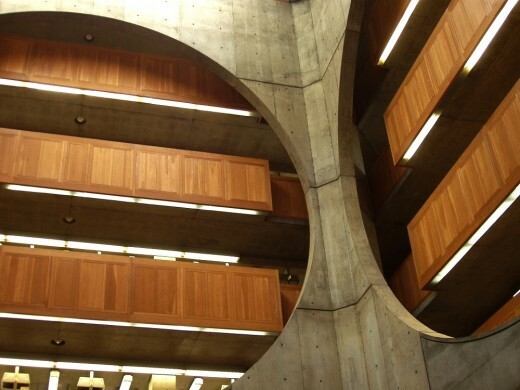 The middle ring, which is built of reinforced concrete, holds the heavy book stacks. The inner ring is a dramatic atrium with enormous circular openings in its walls that reveal several floors of book stacks. 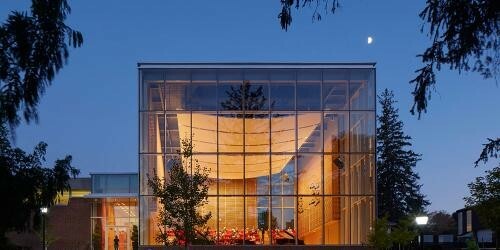 Design: William Rawn Associates, Architects, Inc.